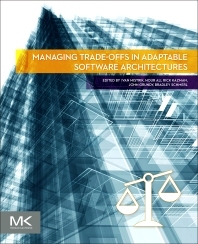 Managing Trade-Offs in Adaptable Software Architectures explores the latest research on adapting large complex systems to changing requirements. To be able to adapt a system, engineers must evaluate different quality attributes, including trade-offs to balance functional and quality requirements to maintain a well-functioning system throughout the lifetime of the system. This comprehensive resource brings together research focusing on how to manage trade-offs and architect adaptive systems in different business contexts. It presents state-of-the-art techniques, methodologies, tools, best practices, and guidelines for developing adaptive systems, and offers guidance for future software engineering research and practice. Each contributed chapter considers the practical application of the topic through case studies, experiments, empirical validation, or systematic comparisons with other approaches already in practice. Topics of interest include, but are not limited to, how to architect a system for adaptability, software architecture for self-adaptive systems, understanding and balancing the trade-offs involved, architectural patterns for self-adaptive systems, how quality attributes are exhibited by the architecture of the system, how to connect the quality of a software architecture to system architecture or other system considerations, and more. Ivan Mistrik is a computer scientist who is interested in system and software engineering (SE/SWE) and in system and software architecture (SA/SWA), in particular: life cycle system/software engineering, requirements engineering, relating software requirements and architectures, knowledge management in software development, rationale-based software development, aligning enterprise/system/software architectures, and collaborative system/software engineering. He has more than forty years’ experience in the field of computer systems engineering as an information systems developer, R&D leader, SE/SA research analyst, educator in computer sciences, and ICT management consultant. In the past 40 years, he has been primarily working at various R&D institutions and has done consulting on a variety of large international projects sponsored by ESA, EU, NASA, NATO, and UN. He has also taught university-level computer sciences courses in software engineering, software architecture, distributed information systems, and human-computer interaction. He is the author or co-author of more than 80 articles and papers in international journals, conferences, books and workshops, most recently a chapter Capture of Software Requirements and Rationale through Collaborative Software Development, a paper Knowledge Management in the Global Software Engineering Environment, and a paper Architectural Knowledge Management in Global Software Development. He has written a number of editorials and prefaces, most recently for the book on Aligning Enterprise, System, and Software Architecture and the book on Agile Software Architecture. He has also written over 120 technical reports and presented over 70 scientific/technical talks. He has served in many program committees and panels of reputable international conferences and organized a number of scientific workshops, most recently two workshops on Knowledge Engineering in Global Software and Development at International Conference on Global Software Engineering 2009 and 2010 and IEEE International Workshop on the Future of Software Engineering for/in the Cloud (FoSEC) held in conjunction with IEEE Cloud 2011.He has been the guest-editor of IEE Proceedings Software: A special Issue on Relating Software Requirements and Architectures published by IEE in 2005 and the lead-editor of the book Rationale Management in Software Engineering published by Springer in 2006. He has been the co-author of the book Rationale-Based Software Engineering published by Springer in May 2008. He has been the lead-editor of the book Collaborative Software Engineering published by Springer in 2010, the book on Relating Software Requirements and Architectures published by Springer in 2011 and the lead-editor of the book on Aligning Enterprise, System, and Software Architectures published by IGI Global in 2012. He was the lead-editor of the Expert Systems Special Issue on Knowledge Engineering in Global Software Development and the co-editor of the JSS Special Issue on the Future of Software Engineering for/in the Cloud, both published in 2013. He was the co-editor for the book on Agile Software Architecture published in 2013. Currently, he is the lead-editor for the book on Economics-driven Software Architecture to be published in 2014. Nour Ali is a Senior Lecturer at the University of Brighton since December, 2012. She holds a PhD in Software Engineering from the Polytechnic University of Valencia-Spain for her work in Ambients in Aspect-Oriented Software Architecture. Her research area encompasses service oriented architecture, software architecture, model driven engineering and mobile systems. In 2014, the University of Brighton have awarded her a Rising Stars project in Service Oriented Architecture Recovery and Consistency. Rick Kazman is a Professor at the University of Hawaii and a Principal Researcher at the Software Engineering Institute of Carnegie Mellon University. His primary research interests are software architecture, design and analysis tools, software visualization, and software engineering economics. He also has interests in human-computer interaction and information retrieval. Kazman has created several highly influential methods and tools for architecture analysis, including the SAAM (Software Architecture Analysis Method), the ATAM (Architecture Tradeoff Analysis Method), the CBAM (Cost-Benefit Analysis Method) and the Dali architecture reverse engineering tool. John Grundy is Professor of Software Engineering, Dean of Software and Electrical Engineering and Director of the Centre for Computing and Engineering Software Systems at the Swinburne University of Technology. Previously he was Professor of Software Engineering and Head of Department for Electrical and Computer Engineering at the University of Auckland, New Zealand. He is Assistant Editor in Chief of IEEE Transactions on Software Engineering, and Associate Editor for IEEE Software and Automated Software Engineering. He is on the Steering Committee of the IEEE/ACM International Conference on Automated Software Engineering. Bradley Schmerl is a Senior Systems Scientist in the School of Computer Science at Carnegie Mellon University, USA. He has been involved in research in self-adaptive systems for over 20 years, starting with his Ph.D. at Flinders University in South Australia, which investigated using configuration management techniques to manage dynamically changing systems. He was a Lecturer at Flinders University and an Assistant Professor at Clemson University in South Carolina before joining CMU in 2000. At CMU he has been involved in research using software architecture models as a basis for reasoning about self-adapting systems, including using utility theory to select appropriate strategies that balance multiple quality and business priorities. · Nenad Medvidovic (University of Southern California, USA) on the Golden Age of software architecture, that continues on in finding solutions to the problem of how quality trade-offs are managed in adaptable software architectures.